The Next Best Thing to a Leg-Up! GetUp is the perfect, handy helpmate to assist you in many tasks like mounting your horse, reaching that top shelf, changing the light bulbs in a ceiling fixture and more. This lightweight, easily portable, sturdy and stable two-step platform gives you that 18 inches (on the top step) or 9 inches (on the bottom step) that can make the difference between strenuous effort and easy-does-it. Storage Area for Grooming Aids or Tools! 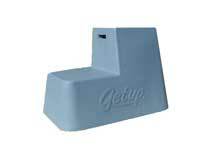 GetUp is also an easy-access storage locker. Carry whatever you need right to where you need it. GetUp is lightweight, yet sturdy. It has a complete interior floor to keep equipment dry. Whenever an extra 18 inches of height is needed, GetUp is there to help you mount up... or boost you up to those just-out-of-reach places in the home, in the stable or in the barn. Carry GetUp anywhere with its molded sure-grip handhold, perfectly positioned for proper leverage whether storage area is empty or filled. 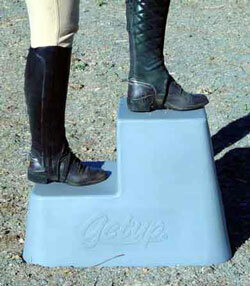 GetUp is the deal way for the young or short rider to mount a horse. There is no longer a need to look for a stump or fence, or to find someone for a leg-up. GetUp is a great help when grooming or washing down a horse. That extra height makes it a lot easier, especially when braiding manes. GetUphas a tip-resistant design. 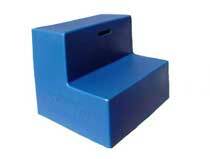 Its broad, flat base assures stability. GetUpis strong and can support the ‘heavyweight’ user. Its special linear, low density polyethylene material provides high impact and weather resistance. GetUpis lightweight (under 10 lbs.) and portable. It has a molded handhold for easy carrying. GetUpalso doubles as a convenient storage box for grooming aids and tools. It has a 6” x 7” opening to provide access to the large 25 1/2” by 16” fully floored interior. GetUp comes in one terrific color... Brown. 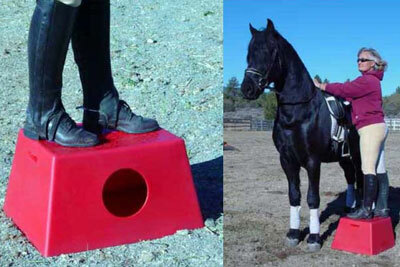 Extra tall, exceptionally stable, lightweight for its size, with large 16” x 20” platform. Best suited for stationary use. 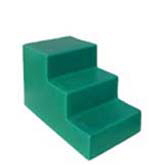 Twelve inch high platform step with large platform area. Very stable and durable. Excellent for wash rack use and boarding trailer tack room. Provides handy containment for miscellaneous supplies.